After 13 months of hemming and hawing, the Senators seem prepared to trade star Erik Karlsson, freeing him from the organization’s perpetual state of dysfunction. All indications are that Ottawa general manager Pierre Dorion has ramped up trade discussions with interested parties around the NHL in recent days after making one last-ditch overture at keeping the franchise cornerstone. And as the John Tavares sweepstakes reached its conclusion Sunday, the hockey world’s attention has shifted squarely to Karlsson’s future. The Senators tabled an eight-year contract extension worth $80 million ($10 million AAV) on Sunday, the first day of eligibility to re-sign their star. Karlsson’s camp reportedly rejected the offer, considered well below market value for a player widely considered the best defenseman in the NHL. As a reference point, the Kings re-signed Drew Doughty, Karlsson’s would-be brother in 2019 free agency, to an eight-year, $88 million extension earlier this week — the richest contract in the NHL for a defenseman. Karlsson, six months younger and more productive than Doughty, is expected to top that benchmark away from the frugal Senators, especially if he reaches the open market and creates a bidding war. So Ottawa’s offer strikes as hollow. Perhaps realizing the writing is on the wall, the Senators this week permitted interested teams to open contract negotiations with Karlsson, according to the New York Post. Any deal is contingent on Dorion and the third-party team first agreeing to the particulars of a trade, but an open door from the Senators all but signals Karlsson isn’t interested in re-signing and is as good as gone, one way or another. Any of the NHL’s 30 other teams would kill to get their hands on the all-world defenseman, but only a few stand out as realistic suitors. The Golden Knights, who reportedly have come close to finalizing a trade twice, the Lightning, Sharks, Rangers, Islanders and Stars are rumored front-runners. To sweeten the pot or lessen the cost of picks/prospects, some teams also may consider absorbing Bobby Ryan’s contract, which comes in at $7.250 million over through 2021-22, as a condition of any Karlsson deal. In the wake of Nikita Kucherov’s extension, Lightning general manager Steve Yzerman made his first public remarks since Tampa has been rumored as a front-runner for Erik Karlsson. Taking care not to mention Karlsson by name (a player who, mind you, is under contract with another team), Yzerman acknowledged he’s entertaining possibilities of making an addition of significance this offseason but denied a trade is close to completion. Yzerman was also asked about the challenges of making such an addition given the Lightning’s cap situation for 2017-18 and beyond. #TBLightning Yzerman says he’s still looking at options on improving team. Said timing of Kucherov, McDonagh extensions not related to any other potential moves he has in mind. The Lightning and star Nikita Kucherov agreed to an eight-year extension worth $76 million ($9.5 AAV) on Tuesday, a discount for a player who has scored more points than anyone in the NHL the last two years not named Connor McDavid. As general manager Steve Yzerman continues to run circles around his colleagues, the immediate question on everyone’s minds was: What about Erik Karlsson? The Lightning are projected for about $13.6 million in salary cap for the 2019-20 season, when Kucherov’s deal kicks in and anchor deals for Braden Coburn and Dan Girardi come off the books. Obviously, that figure will change, and Yzerman still would need to find a way to offload a contract or two to fit Karlsson under this year’s cap ceiling. They are still seeking third-party teams like the Devils or Rangers to help facilitate that, The Fourth Period reported. In trade discussions, it’s believed any team that acquires Karlsson, an unrestricted free agent in 2019, would prefer an extension in place as part of a deal before forking over premium assets. But that can be remedied, too, with conditional draft picks applied to whether Karlsson re-signs with his acquiring team. If anything, locking up Kucherov long term only strengthens the Lightning’s case for Karlsson, who would be hard-pressed to find a more well-run franchise with which to chase a Stanley Cup the rest of his career — in start contrast to the current situation in Ottawa. Tampa sits a little more than $3 million below the ceiling. Steve Yzerman must move out a contract or two in conjunction with acquiring Karlsson, who counts $6.5 million against next year’s cap before a presumed extension would kick in. The Lightning were among the six finalists who met with John Tavares, so Yzerman and staff likely would have already mapped out a plan to accomodate . The most obvious candidates are Ryan Callahan ($5.8 million AAV), Tyler Johnson ($5 million), Braydon Coburn ($3.7 million) and Alex Killorn ($4.45 million), but each player has some variation of a no-trade clause in their contracts. It’s a matter of finding a trade match — hence rumors of a third teams’ involvement — and that could get tricky, but it appears the Lightning are still very much in the thick of things. For the time being, we know that Karlsson is attending the wedding of former Senators teammate (and current Dallas Star) Marc Methot, according to The Athletic’s Sean Shapiro. Dallas had been one of the teams rumored to be involved in trade talks with Ottawa, but according to Shapiro (and others) the major holdup in a potential deal was Stars GM Jim Nill’s unwillingness to include top prospect Miro Heiskanen as part of the package going to the Senators. Heiskanen, selected No. 3 in the 2017 NHL Draft, is part of the next wave of Finnish defenseman. He turns 19 next Sunday, and was named Finland’s best defenseman at the 2018 Olympics, the youngest player in the country’s history ever to receive that honor in that capacity. The Vegas Golden Knights reportedly had the best offer and tried to include Marc Methot in a draft-day deal, but it didn’t carry enough value and the Stars ended up making a much better trade for Methot days later. Since that moment the Stars have been all-aboard the Heiskanen hype train, even if the initial buzz mostly featured mumbled background cheers. They did their best to insulate the defenseman this season, giving him a year away from the North American spotlight so he could play in Finland, compete for his country at the Olympics, and become the youngest-ever winner of Finland’s top defensive award. And such has been Dorion’s challenge. It was at one point reported the Vegas Golden Knights were reluctant to include forward prospect Cody Glass (selected No. 6 in the 2018 NHL Draft) in a Karlsson trade, and Mikhal Sergachev, the 20-year-old defenseman who just came off a strong rookie season for the Lightning (and was acquired a year prior in a one-for-one for Jonathan Drouin) seems to be the essential bit of return required from Lightning GM Steve Yzerman. That leaves Dorion in his current position of trying to either get these teams to bid against each other, or simply hold out for the best possible offer. But as David Pagnotta of The Fourth Period notes, there’s also pressure on Dorion because there’s an overwhelming belief Karlsson won’t re-sign with the Senators before becoming a free agent on July 1, 2019. Karlsson has made it clear he does not plan on signing an extension with the Senators. Their eight-year, $80 million offer, or thereabouts, was a fine offer… just not for a player like Karlsson. Senators GM Pierre Dorion told everyone he’d pitch an offer July 1. He did. Now, he has yet another excuse to trade his captain and tell the fans he had no choice. Pagnotta also said that while Golden Knights general manager George McPhee has become frustrated by all the back-and-forth and lack of an actual deal being consummated, those talks have centered around Shea Theodore, Colin Miller, Erik Brannstrom and Erik Haula. He also said that trade could include the contract of Bobby Ryan, which carries an annual average value of a little above $7 million over the next four seasons. It’s long been reported Dorion was attempting to offload that deal in a Karlsson trade. While there was a report that came out Thursday evening that made a Karlsson-to-Tampa trade sound imminent, Joe Smith at The Athletic reports that while the Norris-winning defenseman could still be eventually heading to the Lightning, a move won’t be coming any time so soon. A deal to send Karlsson to Tampa is all but complete, according to TSN 1200’s Shawn Simpson. However, Sportsnet’s Elliotte Friedman says it may still be too earlier to consider it a done deal. With Tampa still firmly the rumored favorite to land Karlsson, TSN’s Travis Yost is reporting that the Senators and Lightning are seeking a third team to enter trade discussions to help make the money work. That could indicate Senators forward Bobby Ryan could be included in the deal. Ryan is owed $7.25 million over each of the next four seasons, and the Senators have reportedly been looking to offload teh remainder of his contract in potential Karlsson deals. TSN’s Darren Dreger suggested the New York Rangers may be the third team involved in the potential deal. According to Chris Stevenson of The Athletic, Dallas’ unwillingness to part ways with prospect Miro Heiskanen could be the sticking point that ultimately sees the Stars fall out of favor in potential trade negotiations for Karlsson. After one new, cryptic rumor asserting the Lightning were well-positioned to acquire Karlsson, TSN’s Travis Yost echoed the sentiment. Outside of the George McPhee and the Golden Knights, Karlsson’s most frequent pursuant since the middle of last season has been the Lightning. Steve Yzerman’s squad has come dangerously close to a Stanley Cup the last five years, and it’s not like him to stand pat watching the Maple Leafs have all the fun. On Wednesday, The Athletic reported the Lightning should very much still be considered a player in Karlsson trade talks. It’s not clear whether they’ve discussed contract terms with his camp, the report said, but that’s presumably the case, if Tampa is still considered “in.” The biggest hurdle for Yzerman is the salary cap. Just a shade over $4 million under the ceiling, the Lightning were prepared to move out salary in their courtship of Tavares. But they best candidates for that offer tricky situations after Tyler Johnson’s no-trade clause kicked in July 1, joining Ryan Callahan, Braydon Coburn and Alex Killorn, who all would have some say in where they go. The Athletic report indicated any discussion with the Senators likely starts with Mikhail Sergachev, the 20-year-old stud defenseman Tampa acquired from the Canadiens for Jonathan Drouin a year ago. With at least 2-3 other teams in the mix for Karlsson, the price is getting that high, as teams are expected to table their best offers or a deal won’t get done. There’s a debate over which sides has the most leverage, since Karlsson is obviously unhappy in Ottawa, but the fact is leverage is an overblown concept this summer. Dorion needs to be focused on getting the very best return for his superstar, and teams like the Lightning and Stars have incentive to make it happen now rather than later. Stars’ bid hung up on Miro Heiskanen? 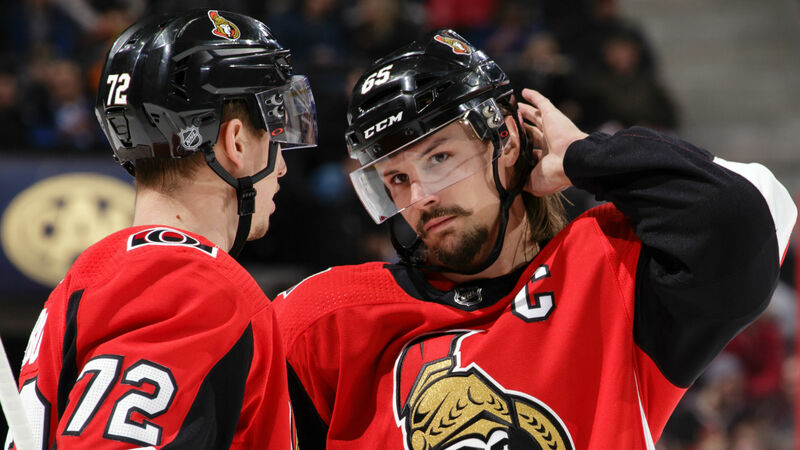 The Athletic reported Tuesday that Dallas has presented Ottawa with the best offer for Karlsson thus far, good enough to earn them the “front-runners” label among insiders. If there’s a trade to be made, the Stars’ offer would need to include either NHL defenseman Julius Honka or top prospect Miro Heiskanen, drafted third overall in 2017. But Heiskanen’s inclusion might be the reason a trade has not yet been made, according to The Fourth Period. Dallas is most certainly in the mix on Karlsson, but I don’t believe Heiskanen is someone they would part with. Could change, but right now he’s not available. Vegas and at least one other team remain in talks with Ottawa. Happy 4th. Honka, 22, was the Stars’ top defense prospect not so long ago, but has been slow to make an impact in Dallas, with four points in 42 games in 2017-18. That doesn’t mean his future isn’t still bright, as the learning curve for young defensemen if often steep, but parting with him would be much more palatable than Heiskanen, who’s been racking up accolades in Finland’s top pro league and could make the NHL jump next year, easily surpassing Honka as the organization’s premier blue-chip prospect. Still, Heiskanen is just that: A prospect. There are other factors at play, such as Karlsson’s extension and more picks/prospects going to Ottawa, but eventually a team will have to accept the cost of acquiring the best offensive defenseman in the NHL. From a Senators perspective, anything less than Heiskanen in a Karlsson trade (which reportedly would not include Ryan’s contract going to Dallas) would be a massive failure, hence the stalemate. It’s shaping up as a matter of which GM will blink first. The Fourth Period has reported the Golden Knights thought they had a trade for Karlsson finalized on two separate occasions (at least): First at last season’s trade deadline, when the deal fell apart at the last minute; and again the day before the draft. No team can combine the assets, cap room and bright future like Vegas, so the upstart Stanley Cup finalists should be considered destination No. 1 for Karlsson. The Rangers, meanwhile, have the means to satisfy the Senators in terms of picks and prospects, and could present Karlsson with a blank check. Except, it’s unclear how the 28-year-old would fit in with the rebuilding Blueshirts, or want to play for them. It’s not a great match, and that seems to be reflected here. Dallas is a late arrival to this party after their Tavares bid feel short, too. It’s not that Jim Nill is averse to making a splash, but the Stars’ cap situation would make a Karlsson addition tricky. They have a shade over $10 million in free space right now, per CapFriendly.com, and also have to consider extending Tyler Seguin, another potential 2019 UFA like Karlsson. Neither extension would kick in until July 1, 2019, though, when another $25 million comes off the books after this season, namely with the timely expiration of Jason Spezz’s contract. Would they have enough room for both? Still, Nill needs to be creative to pull it all off. Reeling from John Tavares’ departure to Toronto, the Islanders and Lou Lamoriello have turned their attention to securing a pretty good consolation prize. The Isles have a lot to offer the Senators in the form of draft picks and prospects, especially after their successful 2018 draft haul, but this is where Karlsson’s 10-team no-trade clause comes into play. Are the Islanders on it? If not, would he entertain re-signing there if traded? The Islanders have stabilized as an organization under Lamoriello, but one would think Karlsson prefers playing elsewhere for an immediate contender, rather than rebuilding another one.